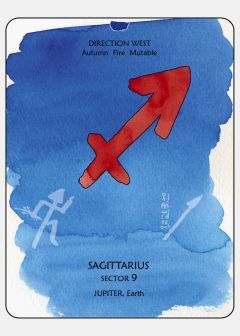 Among all the astrological symbols, I perceive the glyph for Sagittarius as the most straightforward. The archer’s arrow aimed upwards provides an immediate sense of direction, release, elevation and higher purpose. The arrow is also the terminal part of the glyph for Scorpio, and there is no way to understand Sagittarius without Scorpio, and vice versa. The Sun enters Sagittarius on 21 November 2012 at 21:50 GMT. This is the darkest time of the year, yet it is also the most gifted for it heralds the coming of the Winter Solstice, the glamorous 21 December 2012, and the inevitable return of light. This, as I see it, escalates the trust in whatever is genuinely authentic and luminous in each one of us.